Sometimes a clever conceit should remain just that--a conceit. Because no matter how you try to develop it, it will never be as as wonderful as the idea itself. Trying to build upon it and give it complexity strips it of its fanciful "What if?" brilliance and plummets it back to earth. 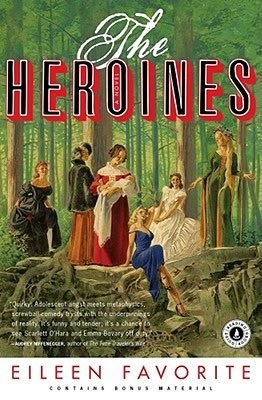 And so we have The Heroines, a novel built around one of the most wonderful ideas I've ever encountered--what if the heroines from famous novels needed a respite from the tragedies of their own storylines--and yet promptly clustermugs the whole thing. Basically, I feel as though I was sold a false bill of goods. The novel purports to be about a bed and breakfast that attracts the heroines of famous novels. Deirdre of the Sorrows, Franny Glass, Daisy Buchanan, Anna Karenina, Hester Prynne, and Catherine Earnshaw have all signed the guest book and checked in for a few days of freedom from the misery of their lives. This is what I wanted to read about--how the heroines come to be at the bed and breakfast and how they interact with a modern world. I expected quirky, witty, and humorous. What I got was dark, disjointed, and ordinary. Instead of focusing on the heroines (who are little more than footnotes), the novel focuses on Anne-Marie Entwhistle and her daughter, Penny. Anne-Marie and Penny run the bed and breakfast and, unfortunately, the novel chooses to focus on their problematic relationship as a result of Penny's coming of age. WTF? Scarlett O'Hara's pounding on the door and instead of focusing on that, a pedestrian mother/daughter conflict is the subject of the book? And that is, in essence, the root source of my disappointment with the book. When heroines do (very briefly) make an appearance, they are flat, one-dimensional versions of their colorful, complex selves. Hester sets about sewing an A on the front of her dress and throwing just enough "thou" into her dialogue to make her seem authentic; Scarlett wakes in the middle of the night to pull down the curtains (for dressmaking purposes, of course) and try to steal the sweet potatoes; Deirdre constantly weeps. They read as caricatures of themselves. As for the plot, Penny is rebelling by going out into the nearby woods despite her mother's rule against doing so. While there she meets and falls in lust with the Irish King of Ulster, Connor (better known as Conchobar in the original Deirdre mythology), who has followed Deirdre into our time. Through a muddled turn of events, Penny is locked up in a psych ward and we have to read about her "it's-all-so-unfair!" experiences there. After finally breaking free, Penny returns to the woods with Connor, during which some awkward sexual awakening occurs and Penny is going through withdrawal from the meds given to her in the psych ward. She spends her days smoking pot while Connor hunts deer and builds huts. Aaannnnndddddd that's pretty much it. Basically, there's just enough inexplicable tragedy and unresolved longing in Penny's life to make one wonder if Penny is herself a heroine (a thought which Penny also considers). Then we have a peculiar shift in narrative and we go back in time to when Penny's mother was a young woman. A point of contention between Penny and her mother has always been the void that is Penny's father. Penny knows that her mother became pregnant out of wedlock, decided to keep the baby against the wishes of her parents, and that her father died in a car accident. Penny's mom is mum on the details of who Penny's father was and what, exactly, was the nature of their relationship. This part of the narrative answers all of the questions Penny has regarding her father. I won't reveal any more here as to do so would be to spoil the ending, but this story line was the best in the book and took about 10-15 pages. The payoff was not worth the other 200+ pages through which I had to drag myself. The story could have been saved if the characters had been more likable, the heroines had made more frequent (and more satisfying) appearances, or if the story hadn't been so self-aware of how clever it was being with all of its metaphysical musings on the nature of "heroines" and storytelling itself.